What appear to be images of the next-generation iPhone have surfaced online raising the possibility that the next version of Apple's popular smartphone may be sold with a white backing. 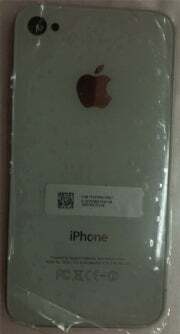 An extensive set of photos were emailed to an Apple repair shop in Huntsville, Alabama showing what are supposedly next-gen iPhone parts including the iPhone's back cover, midboard and glass digitizer. Apple is widely expected to unveil a new version of the iPhone on Monday, June 7 during the keynote address at the company's annual Worldwide Developers Conference. PowerbookMedic, the Alabama-based repair shop, posted the photos on its blog, and says it does not have the actual iPhone parts. The shop says the pictures were e-mailed to them, but does not reveal how or why they came into possession of the photos. Little can be gleaned from the photos other than the fact that the backing has a white color, and there is a camera hole next to the iPhone's earpiece. There is also a hole on the back cover near the hole for the iPhone's rear camera, possibly suggesting a space for a camera flash. The model number, as PowerbookMedic notes, indicated on the iPhone spare parts is XXXXX. The FCC and IC ID numbers also contain Xs. This suggests these parts are from an iPhone prototype, and it's not clear if these parts are from the new iPhone expected on Monday or a future version of the device already under development. In April, Gadget blogs Engadget and Gizmodo posted images of what many now widely expect to be the next-generation iPhone. The new device, exhaustively reported on by Gizmodo, is expected to have front- and rear-facing cameras, camera flash, improved display, a secondary mic for noise cancellation and a new, boxier look. The battery for the new iPhone is also supposed to be significantly larger than on previous models. While the new iPhone is widely believed to be coming on Monday, tech watchers are wondering if Apple will still be able to surprise its audience at WWDC. To find out, make sure you follow along with PCWorld's live blog of the WWDC keynote starting at 10 a.m. Pacific on Monday, June 7.